31 ppm B/W 10 ppm Color, Duplex, 11" x 17". The Ricoh IS300e Image Scanner transforms your laser printer into a versatile multifunction system that provides both document input and output capabilities to satisfy your demanding workflow. Scan documents, photos and more -- up to 11" x 17" in size -- directly to e-mail for fast, efficient electronic distribution; or print out images on your local or network Ricoh Printer. 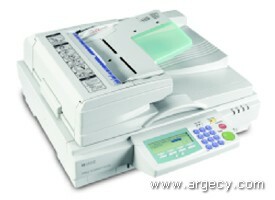 You can even scan documents and output them at your printers rated speed. With the included network interface card (NIC), the IS300e Image Scanner is a shared network solution for streamlining document processing and distribution! * Scan-to-Print maximizes the functionality of your Ricoh Laser Printer by supporting basic copying features, while minimizing the cost of color reproduction. The IS300e Image Scanner takes advantage of the engine speed of any compatible local or network Ricoh Printer you specify to optimize print output efficiency and quality. Your printer investment is further extended through the ability to make crisp copies in color or black & white, on-demand. * Scan-to-E-Mail allows you to instantly and simultaneously distribute scanned documents in TIFF, JPEG or PDF file format to multiple e-mail recipients over the Internet or intranet, saving time and expense versus more tedious and costly faxing. You are also assured the utmost document quality with advanced scanning technology. Conveniently enter and manage up to 2,000 e-mail addresses right from your desktop with Web Status Monitor. * Scan-to-Folder lets users send scanned forms, applications, reports and other documents to a designated folder on the network for review, providing a cost-effective archival and basic print-on-demand solution. As this utilizes your existing LAN or WAN network infrastructure and requires no additional hardware/software, archiving hardcopy documents is as easy as it is inexpensive. Through the user friendly operation panel, users can send a scanned document to a Windows based registered folder or use Web Status Monitor to enter and send a customer file to any shared file. * Scan-to-FTP facilitates sharing files outside the network and within different Operating Systems. * TWAIN capability allows you to capture hardcopy images in digital form for further editing back at the host PC, for incorporation into various TWAIN-compliant software applications, or to save for future use. * Putting you in control. The Ricoh IS300e Image Scanner empowers your business with the benefits of centralized color network scanning by smoothly integrating with your existing setup. Advanced Ricoh software brings it all together and puts you in control of your documents and office systems. The innovative Ricoh IS300e Image Scanner works harder and smarter to make the most of your printer investment. ORIGINAL SIZE- Up to 11" x 17"
Supported File Formats : Black & white: Single/Multi Page TIFF, PDF. Color: Single-TIFF, JPEG, PDF/Multi Page-TIFF, PDF. SCAN-TO-FOLDER-Resolution: 100 dpi, 200 dpi, 300 dpi, 400 dpi, 600 dpi, 100 ~ 1200 dpi/1-dot step. Security: Encryption of password during transmission of Scan to SMB and Scan to FTP. Supported File Formats: Black & white: Single/Multi Page TIFF, PDF. Color: Single-TIFF, JPEG, PDF/Multi Page TIFF, PDF. SCAN-TO-PRINT-Resolution: 100 dpi, 200 dpi, 300 dpi, 400 dpi, 600 dpi, 100 ~ 1200 dpi/1-dot step. Speed: Continuous printing speed same as printer speed. First Print Speed: Depends on the printer specifications and document type. DIMENSIONS - 25.5"w x 10.4"h x 23.2"d WT.- 64 lbs.